Any great grandchildren? Not yet! What do your grandchildren call you? Grannie. I had planned on Nana, but when I saw my first granddaughter, the word Grannie just popped out of my mouth. It's what my children called my mother, and what I called my maternal grandmother, and it just seemed right. How often do you get to see your grandchildren? I see one daughter's family at least once a week. The other daughter lives an hour away, so I usually see her family once every two weeks. My son is divorced and doesn't have primary custody, so we see his daughter less often--about once a month. We occasionally travel with our kids and grandkids, as well as sharing beach houses and attending family reunions, which give us more extended periods to be together. 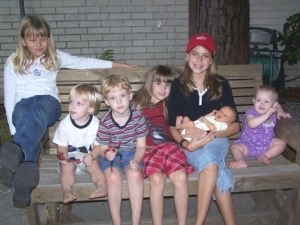 An older photo of all seven grandkids.What is the best thing about being a grandma? Getting that unconditional love! What is the most challenging part of being a grandma? It is definitely challenging to have the energy level to keep up with them. It requires taking care of myself and resting before visits. 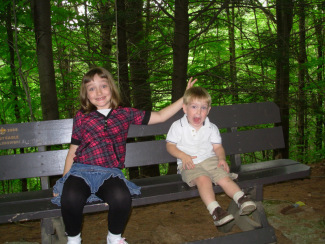 Describe a recent time that one (or more) of your grandchildren made you laugh out loud. My youngest granddaughter started kindergarten this year. One day I was asking her about school, and she told me that everyone at school liked her. "Everyone likes you?" I queried. "Of course," she said. "I'm smart and I'm beautiful." No low self-esteem problems there! 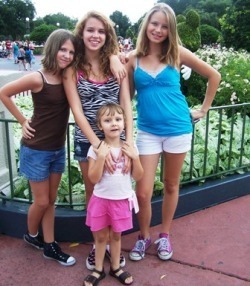 Four of the granddaughters at Disney World.What is your favorite thing to do with grandchildren who visit your house? I love to be outdoors with them. They ride their scooters, and we toss a ball around, go for walks and play outdoor games. Indoors, we enjoy Legos and puzzles. We also are maniacs about Bananagrams. What is your favorite thing to do when visiting grandchildren at their house? I enjoy meeting the friends of the older grandchildren. In general, it's fun to visit their houses because I'm not the hostess, and I get to play and relax! "Traditional grandmother mode. 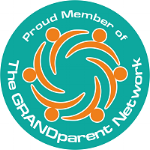 "How do you maintain the bond between yourself and your grandchildren between visits? I'm not as good at this as some others. I keep up with the two oldest on Facebook and through occasional text messages. I occasionally send the others a card or a gift through the mail. They all like getting things in the mail. What do you most want to pass along to your grandchildren? I want my grandchildren to be generous souls who care about others, who are open-minded, who stand up against bigotry and demagoguery and greed. My children and I have the same social and political values, for the most part, and I think I have a good chance of having grandchildren who are the same, because they are being raised by my children. 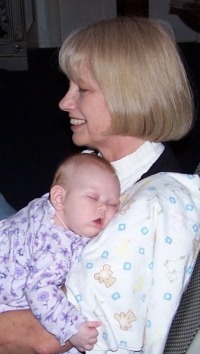 Be sure to visit Susan, the About.com Guide to Grandparents, at http://grandparents.about.com.